Dri is more than a special client. She has already asked me to create an illustration for her oldest son, illustrations of herself in different clothes, an illustration of everything that’s in her handbag (it’s a lot!) and has been illustrated as a well travelled tourist. But she still wanted some more illustrations, so her blog would be totally personalized. 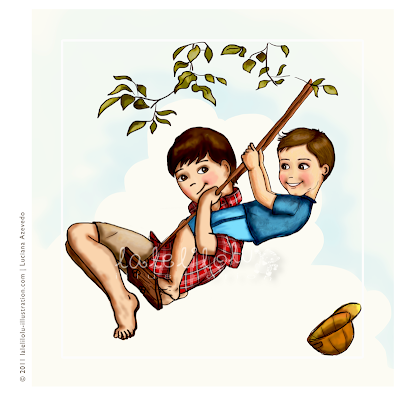 For the topic “Just for Kids” she wanted a reinterpretation of the beautiful artwork “Young love: swinging” by Norman Rockwell, but replacing the original characters by her two boys Rafa and Ro. Please, try not to compare the two illustrations, it’s not fair – Rockwell was a genius of painting! OLá Lu querida, a Dri é super querida. Fiz o roteiro dela pela Alemanha. Ela viajará logo. Vc é demais, adoro suas ilustraçoes, parabéns. Ficou um belíssimo trabalho, aliás, como sempre! Eu me amei no restô, e simplesmente mais que amei os meus meninos, de longe vc superou todas as minhas expectativas. Muuuuuito obrigada por fazer tudo isso para mim. Você está praticamente ali com a minha fada madrinha que realiza todos os meus desejos, hahahaha. ei queridas, vcs são todas uns amores, obrigada!